Please check out the links and documents below from Archbishop Mancini and the Archdiocese of Halifax-Yarmouth. Archbishop Mancini has written a letter with an update about Archdiocesan restructuring, which you can read it here. 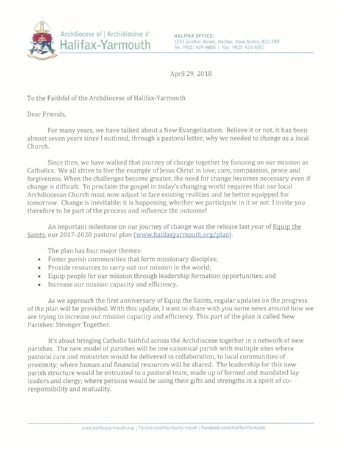 While Saint Benedict will not be joined with Saint Ignatius Parish, we plan to provide as much support as possible for the parishes of our Archdiocese during this time of change. On October 11-12th, the clergy of our Archdiocese gathered with Archbishop Mancini to discuss new parish proposals that are part of the Equip the Saints initiative. The Archdiocese proposed a plan that would group existing parishes together into 19 new parishes. The Archdiocese shared a proposal for Saint Benedict Parish with Fr. Simon in mid-September and we understand this proposal will be shared in greater detail at the Archdiocesan Assembly of the People of God next weekend. 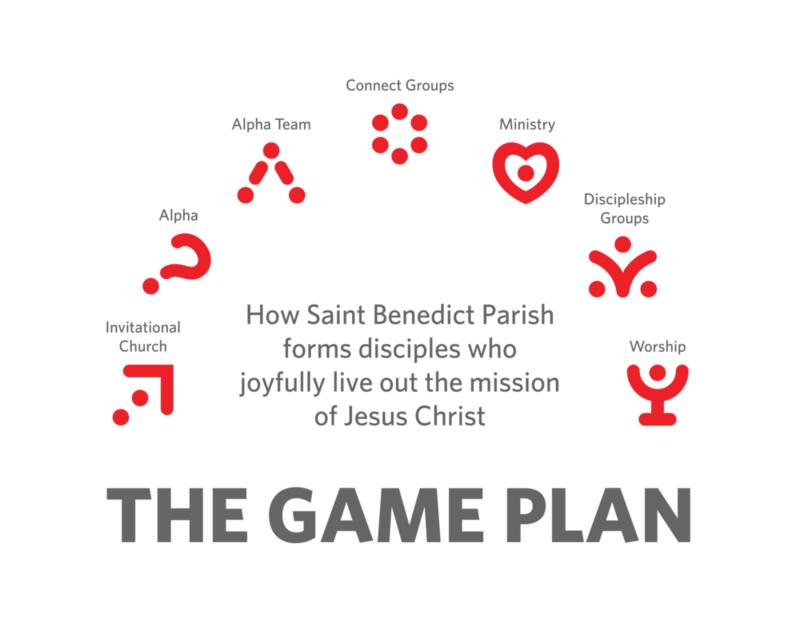 The Senior Leadership Team at Saint Benedict Parish is deeply committed to our mission as laid out in the Game Plan and remains in discussion with the Archdiocese. When we have more concrete information, we will share it. Please pray for wisdom for everyone involved, and for God’s will to be done. Archbishop Mancini has issued an update on Equip The Saints. Please click here to read the two-page document. Click here to visit the Archdiocesan website for additional Equip The Saints information. Please click here (or on the image of the letter on the left) to read an important letter from the archbishop that is being read at every parish throughout our entire diocese on the 5th Sunday of Easter. As most are aware, our parish went through an amalgamation several years ago when St. Pius X, St. Lawrence and Our Lady of Perpetual Help came together to form Saint Benedict Parish in 2007 - culminating in the opening of the new church building in 2010. Nevertheless, it is important for us to be aware of the significant change that is taking place throughout our diocese in the near future. At this point, it is unclear if/how Saint Benedict will be impacted by the “network of new parishes” that is being proposed. Fr. Simon will keep the parish in the loop as new information becomes available. If you haven't already, please go ahead and read the Archdiocesan Pastoral Plan Equip the Saints, linked here. This link will open a pastoral plan document on the theme of Communities of Missionary Disciples. Visit the Archdiocese of Halifax-Yarmouth website home page here.